If you’re looking for part-time seasonal work, you may want to check out this new job at Jackson Hewitt, the tax preparation company. No tax experience necessary. 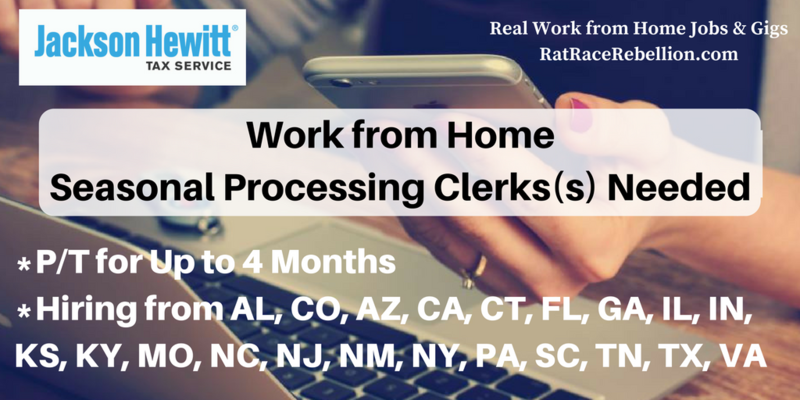 They’re looking for one or more Processing Clerks to work 24-40 hours per week, for up to four months. Pay isn’t mentioned, though Data Entry Clerks at JH reportedly receive $9.12/hr. Your job would be to monitor their system for “flagged” files. You’d check to see if the file had the documents the company requires. If necessary you’d call the JH tax return preparer for more information. Other admin duties may also be assigned. The company’s hiring from AL, CO, AZ, CA, CT, FL, GA, IL, IN, KS, KY, MO, NC, NJ, NM, NY, PA, SC, TN, TX and VA. Requirements include good communication skills, internet and Excel experience, and schedule flexibility. You’ll also need to be taking a community college or college course (working towards a degree), or have a college degree. To go to the job, click here. Employee reviews give the company overall 3.6 stars out of 5 on Glassdoor and 4.1 on Indeed. This entry was posted in Administrative & Clerical Jobs, Part-Time Jobs, Seasonal Jobs, Work at Home Jobs and tagged Jackson Hewitt. Bookmark the permalink.